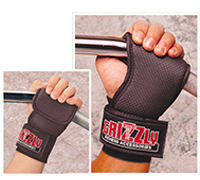 Grizzly Grabbers, unique three in one product - Protects Hands like a glove, and Functions as Lifting Grip, Wrist Wrap Combination. Textured neoprene grip straps combined with neoprene padded, adjustable wrist support for extra comfort. Cinch ring and velcro® closure. Size small fits a women's hand, size large and X-large fits a man's hand.